Gastritis is defined as inflammation of the gastric mucosa. The word is derived from the Greek "gastro"- meaning "of the stomach" and -"-itis", meaning "inflammation". Gastritis may be acute orchronic, and it may be associated with conditions that are more serious. What are the signs of gastritis? The most common clinical signs associated with gastritis are acute vomiting and decreased appetite (anorexia). Other clinical signs may include dehydration, lethargy or depression, increased thirst, blood in the vomit or feces, and abdominal pain. Acute gastritis is typically self-limiting and of short (less than twenty-four hours) duration. The cause is normally not discovered because the clinical signs usually resolve before diagnostic testing is performed. 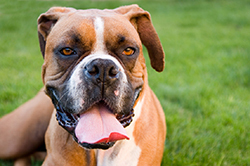 Acute gastritis occurs frequently in the dog. 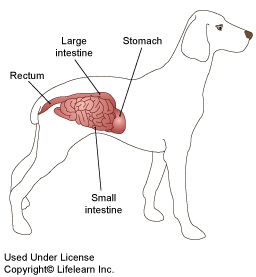 Dogs are particularly prone to "dietary indiscretion" which includes the ingestion of spoiled or raw food, non-food items such as garbage, cat-litter, foreign objects, and plants, exposure to toxins, molds and fungi, feeding inappropriate foodstuffs such as table scraps or leftovers, or being fed large quantities of food. With acute gastritis, most dogs recover in one to three days with supportive treatment, which includes a short period of withholding food. The prognosis is usually good, even if the primary cause is not identified. Tests for gastritis may include blood tests, urinalysis, abdominal x-rays, abdominal ultrasound and endoscopy. 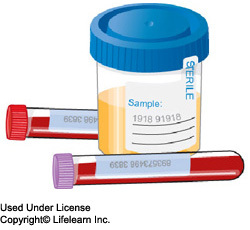 In acute cases, only minimal diagnostics such as blood and urine tests are required. "If the gastritis is chronic, more involved testing will be undertaken..."
If the gastritis is chronic, more involved testing will be undertaken to determine the exact cause of your dog's vomiting. Treatment is based on the specific cause. Most acute cases resolve without medical intervention. Offer small amounts of water frequently during the first 24 hours (if fluids cannot be given orally without inducing vomiting, seek immediate veterinary treatment). The prognosis is good for cases of acute gastritis. For chronic gastritis, the prognosis is based on the exact underlying cause.